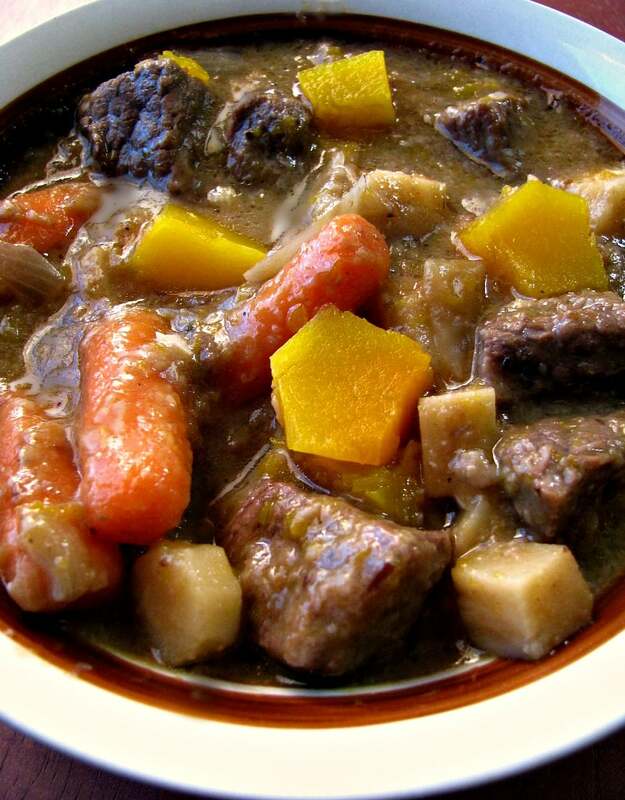 Loaded with fresh pumpkin pieces that dissolve and thicken the broth, beef, parsnips, and carrots, this Pumpkin Beef Stew is perfect for cold Fall evenings. Top with additional steamed or simmered pumpkin for even more flavor. Welcome to Day 3 of #PumpkinWeek hosted by Terri of Love and Confections. I hope you found some great new recipes using pumpkin already, but if not, there is more to come! While making today’s recipe I discovered that diced pumpkin, once completely cooked, actually works an a thickener. There is flour in this recipe, but it is the pumpkin that makes the broth thick and flavorful. It was so good Amanda ate it, twice, without complaining! The pumpkin doesn’t start to dissolve until towards the end of the cooking time. If you would prefer more chucks of pumpkin you can easily cook them separately and then add them to the stew when serving. 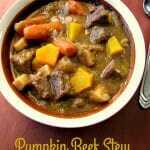 Read on after the Pumpkin Beef Stew recipe to see all the great recipes shared today. 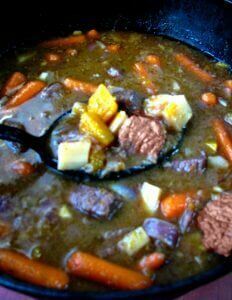 For more beef stew recipes, check out Beef Mushroom Stew or Beef Bourguignon. Place the cut up beef in a freezer bag. Combine the flour, salt, and pepper in a bowl, stir well and add the mixture to the bag. Seal the bag and shake well to coat the beef. Add two tablespoon olive oil to a dutch oven or large soup pot over medium-high heat. Once hot, brown the beef, working in batches, adding additional olive oil between batches. Remove browned beef to a large plate, set aside. Once all the beef is browned, add the beef broth and red wine to the dutch oven, scrapping up the browned bits from the bottom with a large spoon. Return the browned beef to the dutch oven; bring to a boil, reduce heat, cover and simmer for 45 minutes, stirring occasionally. Add the chopped pumpkin, carrots, parsnips, onion, garlic, and dried oregano, adjusting the heat so it stays at a simmer. Re-cover and cook, stirring occasionally for 45 minutes more, removing the lid for the last 15 minutes or so. What a perfect, warming autumn feast. Oh my goodness this looks absolutely amazing. 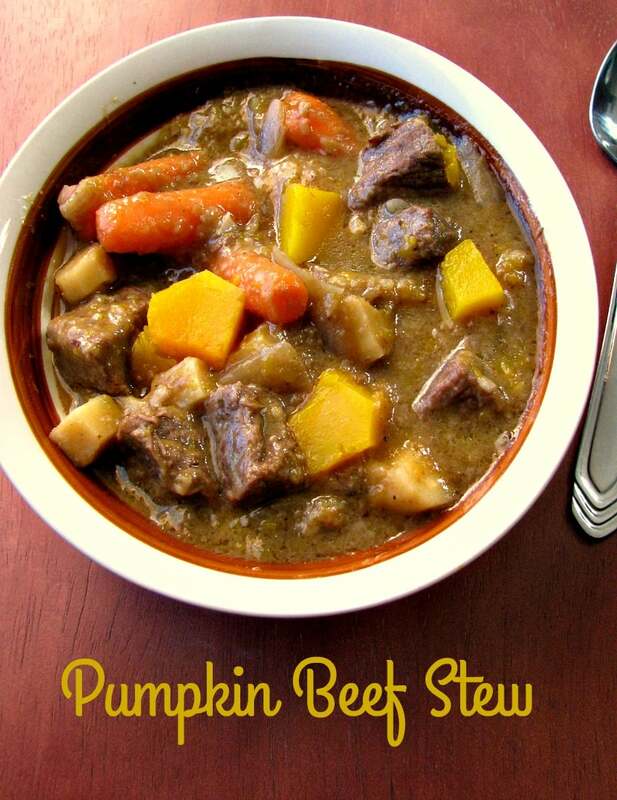 I love a good beef stew – the addition of pumpkin is perfect. Thanks Rebekah, my whole family loved it.